With just one change to the starting eleven predicted in the preview Unai Emery looked to be sending his team out with a strong attacking intent. The preference of Mesut Ozil ahead of Granit Xhaka owed everything to the latter being ruled unfit and gave us a number of options going forward. Would it be solid enough defensively? That was what many would have questioned before kick-off. A bright start earned us a second minute corner sadly rendered pointless by some argie-bargy in the box. Astonishingly the second ended in similar fashion. The pressure continued when Ozil sent Sead Kolasinac flying in from the left to cut a fine ball back to Aaron Ramsey. The Welshman’s drive struck effectively a three man wall in front of the visitors goal and Ainsley Maitland-Niles left foot pile driver foundered on the same wall. The high press paid off, as it would continue to throughout the half, when a brilliant team move involving Ramsey, Maitland-Niles, Ozil, Ramsey, and Alexandre Lacazette ended with Ramsey (again!) passing the ball inside the far post. It was the start the Gunners needed. That will be replayed on social media many times over the coming years. As the clock ticked past twenty minutes the stadium I swear looked as though if lifted when Torreira won a tackle in the middle of Napoli’s half, carried it to the defence and dummied the first defender before letting fly and leaping for joy when it deflected off Koulibaly and into the net. This was more than we could have expected in our wildest dreams, wasn’t it? Napoli had flattered to deceive on a couple of breaks and were clearly nervous of committing bodies forward with The Arsenal in this mood. A rarity denied us a third thirteen minutes from the break. Pierre-Emerick Aubameyang sprinted clear on the left and cut the ball back for his best friend, Lacazette, who misjudged the pace of the ball and made an air shot. Aubameyang and Lacazette switched sides and the former’s fierce drive was all but spilled into the path of the French international by goalkeeper Meret.. From closer range in the same channel Aubameyang attempted to chip Meret but the goalkeeper claimed it and it remained 2-0. The mesmeric Ozil left two Napoli midfielders for dead with a delicious dip of the shoulder and turn through 180 degrees. Unfortunately he ran straight into Koulibaly. We were given a warning in the last minute before the whistle when an unmarked Insigne let fly from close to the penalty spot but fortunately lifted a poor attempt over the bar. In the seconds that remained Ramsey had a chip at full stretch saved by Meret. What a half of football we had witnessed. Probably berated by Ancelotti at the break, Napoli started the second-half with a poor challenge by Hysaj on Lacazette that earned him the first yellow of what had been a far from nasty contest. The visitors did get a break when Nacho Monreal was caught under a long ball on the left side but the excellent Laurent Koscielny was on hand to block the cross. Evidently they had been commanded to seek an away goal and were much more adventurous. Insigne netted from a blatantly offside position but it was yet another warning. Koulibaly’s ‘shoulder’ from a corner was tipped over by Cech. Ten minutes of Napoli pressure introduced an air of nervousness and Ozil stepped up to the plate to drive us into the right direction again. When Ramsey’s thumping drive was superbly tipped away for a corner by Meret, Monreal was a whisker away from heading our third. Kolasinac suddenly collapsed to the turf, perhaps a result of the effort he, among ten others had put in. He survived somewhat surprisingly the substitutions that followed when Lacazette and Ozil were replaced by Alex Iwobi and Henrikh Mkhitaryan. There was no audible dissent from the crowd, but the standing ovation they gave to both the departees spoke volumes. Clearly recovered, Kolasinac again owned the left flank and when his cross was tipped to Maitland-Niles beyond the far post the Napoli goalkeeper produced an excellent save. So close. How close did we come to regretting it when Insigne’s cross ended with the unmarked Zielinski contrived to lift the ball over the target. Perhaps that vigorous work we had put in was having an effect on us? Mohamed Elneny was introduced for Torreira with fourteen minutes remaining. Cue another standing ovation. Another fantastic fluid team move ended with Mkhitaryan putting one on a plate for Ramsey who unusually rushed his effort high into the North Bank. “Come on Arsenal” echoed around the bowl as supporters sensed they were needed for the closing ten minutes. Ounas stung Cech’s palms as Napoli again exerted pressure. What a different half of football this was, much more even. Ounas again tok possession, galloped unchallenged down the right, but crossed thankfully too close to Cech. Seconds latter half of the stadium, and an old fella in Swindon erupted when Aubameyang made the net ripple from a wonderful Mkhitaryan pass. The realisation that he had hit the side-netting was a horrible come down. Four added minutes could not have been more nervy, and it didn’t help that Koscielny suffered a serious attack of cramp when knocked down by Zielinski. A clean sheet against the team second in Serie A, the second favourites for the Europa League, was confirmed by a shrill blast of the whistle. What a night. Advantage The Arsenal, but can we produce the necessary performance in Naples? Nice summary, ‘holic. Having missed watching the game I will check out the Ramsey goal expectantly and watch the whole thing later. Anyways, it has to be chalked up as a good response to a poor display at Everton. Now to continue searching for the twin holy grails of consistency and stout away performances. Arsenal 1-0 looked like a knife through butter. I wish defenders gave us that much time and space in the Premier League. Nice buildup play though, and prominent involvement and assist by AMN is a real confidence builder I imagine for him. Arsenal 2-0 I wish Premier League defenders would dally on the ball while facing their own goal in their own half like that Napoli defender did just prior to Torreira taking it off him. But Lucas was where he needed to be and took full advantage so all credit to him for the goal and to Arsenal for the clean sheet, which has to be the best accomplishment of the night. What a shame your illness has prevented you from attending another great home European night for the Arse. Every player excellent across the park against one of the best sides in Europe. How many times do we say the early goal is so important,at Goodison we conceded it,tonight we scored it,and you could see the difference it made not only to our boys but the supporters as well. Keeping a clean sheet was my most important consideration tonight,and i am confident if we take our best team to Naples,we can score at least once,to make them need 4. To give added confidence to fellow Gooners,you have to go back to the 2010/11 season for the last time we lost a European knock out stage tie after winning the first leg,and that was against the mighty Barca. On the 8 occasions since then,we have come up smiling. Next week i am positive we can make it 9. Just got to the match after an accident in front of me blocked the motorway but very glad I made the effort . I’m sure Naples will provide a forbidding atmosphere but we can score there and we have a better team than them and are capable of playing with more intensity and we have a lot of pace that can trouble them on the break. Props to all the team. The three defenders did very well especially Koscielny. Kolasinac was excellent and AMN shows many signs of developing into a top class player. Ramsey continues to show a wonderful attitude allied to great ability and our strikers work incredibly hard and provide a range of threats . Frankly we should qualify if we weren’t asking the Arsenal away team to fulfil the second leg ! On my way back from the game, my teenage Gooner enjoyed this encounter and so did I. Great first half it has to be said we should have score few more as well, in all fairness they didn’t exist. In the second half we left the foot of the gas it was clear to see and should have scored with chances that came our way. I really wanted the third goal to go in and have this advantage taken to them, but it wasn’t meant to be. We lost a bit of rhythm with those subs and it was clearly visible. Excellent summary, Holic. We were very good in the first half and could easily have been 3-4 up at HT as we took the game to Napolli an pressed them all over the pitch. We seemed to have been told tohold onto the lead in the second half rather than to continue on the front foot but nonetheless could have/should have added a couple more. On tonight’s performances we shoud be capable of an away goal but the travel sickness of this squad this season leaves me regretful that we didn’t take another of those chances. Well worth the 2-0 lead. Now finish the job. ATG, What with you and your teenager in attendance tonight, as well as NDR and daughter that makes it quite a night for the dads and their younguns in these parts. Excellent to hear your teenager is hooked. It shows good parenting, no doubt. Just got in from an enjoyable evening at The Grove. A great first half performance as we deservedly went in at half time with a two goal lead. We were all hoping for much of the same in the second half but we were a tad wasteful. A third or fourth would not have flattered us and I do hope that we don’t end up regretting those missed opportunities. Kos and Sokratis at the back with Mustafi nowhere near instantly makes us look both stronger ne’er and more organised at the back. Torreira Just in front also gives us added security and more balance. Such a shame that combination was not available at Everton. Strong performances all over the pitch tonight amongst a great atmosphere. The crowd were getting slightly nervous as the game reached a conclusion, but were vocal and supportive throughout. All in all, a very pleasant evening. It’s annoying that so late in the day we have found a way to combine the talents of Ramsey and Ozil. For so long conventional wisdom had it that they couldn’t play together. I think they can at home and tonight like in the United game they proved it. Having said that I wouldn’t start Ozil in Napoli. I would play tonight’s team but would play Xhaka or Mkhitaryan instead of Ozil. I think Emery will bench Aubameyang but I would play him and Laca together. The key is Ramsey. In a freer role he could destroy Napoli . I hear Sanllehi decided to dispense with his services. Emery must be so disappointed to be losing him . To be losing him for nothing is mind blowing. Having to play Watford on Monday is an awful problem. It’s a vital game and they are a team of scrappers and strong pressers. But if we can win on Monday and survive in Naples it will be terrific . Just back from dining out on Neapolitan thin pizza. Delicious. Skipped the Neapolitan ice though, it is too cold here to contemplate. Funny enough few years back he would sit with me and watch the match, then five minutes later he would loose interest and move onto something else. Most of all he loved the atmosphere and was singing his heart out, bless him! to kill off the tie. to come off the bench if needed. Matt @17, I agree that Unai has to earn his managerial corn over the next three matchs by selecting the correct 11 for each challenge whilst preserving fitness. I too would select the same 11 for the away leg as the 11 that should have won by an even bigger margin last night, in the hope that we can finish the job with an early away goal. I would also select a group of scrappers for Watford away as that is inevitably going to be a physical battle. Although he would be top of my list for that kind of game, sadly Sokratis is suspended. I agree that Kos may struggle to play three games in a week but he may well have to play on Monday against Watford otherwise our central defence is going to be extremely vulnerable. If Kos doesn’t play, I would expect us to play a back 4 of necessity and that back four: AMN, Mustafi, Monreal, Kolasinac, looks extremely vulnerable as, while AMN & Kola are effective wing-backs neither is a decent FB and a central pairing of Mustafi and Monreal facing Deeney, even screened by Torreira, doesn’t bear thinking about. We are being treated to a series of majestic performances at The Grove at the moment and night was another, hugely enjoyable, crisp spring night in the classy end of North London. There was a palpable big match buzz in my little Greek restaurant before the game, rammed to the rafters and turning away anyone who hadn’t booked. When I got into the ground, about 20 minutes before k.o. the Napoli end was packed, the Arsenal stands rather less so (always too cool for school our fans, enjoying one last pint). However by five minutes after kick off the place was full, mostly regulars, few tourists (at least in my bit of the North Bank lower). The landlord’s excellent report (sorry you couldn’t make it Dave but hopefully your attendance at Swindon means you are now set up for Easter Sunday against Palace) makes it not worth re hashing the game, but several players really impressed for me. Ramsey was imperious. Mesut was at his magician best, producing flicks and tricks that made you gasp. One run in the first half, from the right wing in towards the centre of their defence, bouncing the ball from left foot to right foot as beat three men reminded me of Santi (I love that little man) was spell binding. Torreira was terrific and seems to have benefited from a suspension induced rest. His goal, robbing a Napoli player in the centre circle, driving forwards a la PV4 (albeit with legs a foot shorter) beat his man with an athletic jump turn and then drove in his shot which deflected in. He brings huge direct energy and is far more than just a destroyer. Finally I want to give a shout out (as the kids say) for Ainsley, our own double barrelled utility player. I thought he had his best game yet, tenacious in the tackle and dangerous in attack where he is getting further forward. His assist for Ramsey’s goal was beautifully judged. I have to say I didn’t like the subs. No doubt he had his reasons but with 25 minutes to go he broke up the rhythm of the side. Iwobi was downright poor (for a big tall lad he doesn’t win much in the air). But I’d have settled for 2-0 at 8pm. So another great night at home. But two huge away games in a week (again) that could make or break our season. Any news of H2H, ‘holic? I sure di miss reading his comments and his updates on the bar in Holland.!! Absolutely no quarrel with your approach in terms of hitting them hard in attacking terms. My worry with Mesut is if we don’t have the ball when I feel Xhaka or Mkhi will be more valuable, but if we need a goal if we fell behind Mesut is a necessity. Ancelotti seemed to imply they were much fitter than us because several of our players got cramp . But I thought our players worked much harder, certainly with more intensity than they did. If the rumoured £300,000 a week for Ramsey’s withdrawn contract was in the budget, then that would be an extra £15 million or so in the pot. Tommy was a tough as old boots, a traditional old time enforcer among many back in the day, who played for a very successful Liverpool side in the 60’s and 70’s. Was in the side that lost to us in the 71 Cup final. Sadly ended his days as many old footballers seem to do,in a nursing home suffering from Dementia. On a brighter note,following on from H’s post about the quality of Women’s football,our Ladies under 21 side have reached the final of the Super League Cup,where they will play Man Utd Ladies,and our under 16 girls team have reached the Final of the FA Youth Cup where they will meet Chelsea. With the senior Ladies team on the brink of winning the Title and being back in the Champions League next season,it has been a very encouraging period for the Club. Judging by Barcelona’s injuries and suspensions it looks like Thomas Vermaelen may have a chance this week to make his semiannual appearance, possibly in the front line? Time to look up the odds against him to score first. Interesting, the difference between suspended and banned. Must have something to do with the Spanish Inquisition. Since joining Barcelona in 2014 he has made only 33 appearances and scored once, but is apparently still on their books. come to this away from home. for long stretches of the game. to give them a bit of hope. Ashley Barnes’ kisses. Should that not be subject to retrospective review and more serious punishment? Mike Dean gave Arsene Wenger yellow cards just for pouting at him. Verminator might consider trademarking the name and going into the vacuum cleaner business, OM. Whoops, somebody already did that but for gopher control. See the kind of silloness these Monday night games bring on? Maybe they can unleash the Verminator on Troy Deeney. Quite seriously, that should have been silliness, with an i. 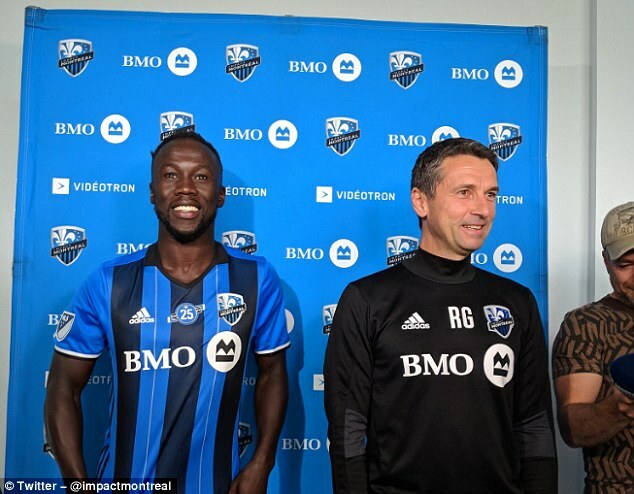 Another name for the where are they now in North America file, Bakary Sagna, is now on the roster of Montreal Impact. Not sure what kind of an impact he has had so far. Also Philippe Senderos for Houston and Carlos Vela for Los Angeles, Vela doing quite well with his goal scoring and such. Gotta say I love the Masters. Really hoping a Gooner can win it tomorrow. Come on Poults! A torture device used in the Spanish Inquisition that was later adapted for extracting excessive fluid from wide strips of pasta. A device that has gone out of style due to its poor taste. Oh, that doesn’t pleasant at all. There was a time when you just use a leech, OM. Can’t stop technological progress, I suppose. bt8b@34: Remi Garde, also late of this parish, is head coach at the Montreal Impact. Re: OM @37. They may not make Exsagnaguinators like they used to but I will be looking forward to the visit of the Montreal Impact to Minnesota later this season when I will be able to report from a relatively close vantage point whether Bakary is still maintaining his cool hairdo with lines of beads and such woven in. Also, Ned, to report on whether Remi Garde is still maintaining such good and erect posture after all these years. Also, that Salah goal was not bad and it was not by a Chelsea player. What is not to like? We really should have signed Sadio Mane, Ngolo Kante and Virgil Van Dijk. At least they would definitely be in my fantasy team if I could afford them all. bt8b@48; Bac sports quite the short back and sides these days, it seems. Remi Garde looks as upstanding as ever, however. Re:52. Pine straw fan myself. Brings back the receding memories of living down south. Still think of them as needles though. Been away for the weekend but just thought I would check in to report on my 11 year old’s first home game. The walk down from Highbury and Is station via my favourite burger van took on a whole new quality with an excited young ‘un full of questions about the Arsenal’s history and her dad’s shady past. Obligatory shop stop completed we took our seats in the JG section. Never sat there before and have to say the noise and enthusiasm put many ‘older sections’ of the stadium to shame. The game went by in a blur with both Gunners goals right in front of us and celebrated with massive enthusiasm…she even seemed to pick up on the second half nerves of some of us older heads, making it quite the all round first game experience (if we had turned them over 5-0 it would not have been the authentic afc experience would it ?). All in all one of the great days. Hello you wonderful people. What a tough weekend this has been. Nearly over now though. Some late gibberish about tomorrow, not clearly thought through, just from the scrambled mind of an exhausted nutcase.